Archbishop Emeritus Desmond Tutu drew a crowd of hundreds as he addressed students and special guests at a Community Festival organised by the University of Southampton’s Students’ Union last week. The Archbishop gave an emotional and inspiring talk about how to address societal problems in the 'Ubuntu' way. He covered a range of subjects from the success of young people to fighting the war on terrorism. Ubuntu is an ethic or humanist philosophy focusing on people's allegiances and relations with each other and is seen as a traditional African concept. The festival, organised by ‘RAG’ or 'Raise and Give' – the Students’ Union’s fundraising department, also featured a steel drum band, live music and dance performances, and a number of stalls and displays. The event was in support of the Tutu Foundation (UK), one of Southampton's RAG charities this year. In the evening, a fundraising dinner in honour of Archbishop Emeritus Desmond Tutu took place on campus. The Tutu Foundation (UK) was launched in June 2007 to continue the inspiring and transforming work of Archbishop Tutu in the United Kingdom. More information about the Tutu Foundation can be found at: www.tutufoundationuk.org. 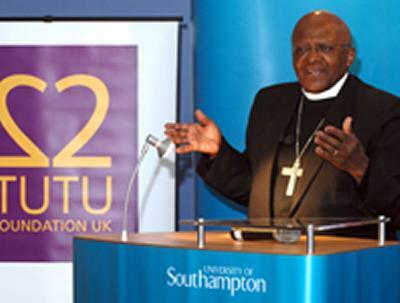 Watch Archbishop Tutu's speech on SUSU TV.